I love mushrooms, but the rest of my family does not. They don't even like the heavenly aroma of mushrooms drenched in butter frying in a skillet. (Crazy!) So one Saturday afternoon, while they were out of the house, I made stuffed Portobello mushrooms for my lunch and didn't have to hear "That's disgusting! How can you eat that?" even once! This is a "pizza recipe" from a health and fitness site. I'm assuming that when you have a craving for pizza you're supposed to eat this as a healthier substitute. I don't know if I would go so far as to say this tasted exactly like pizza, but it was delicious! 2. In 2 tablespoons of olive oil, cook the diced onion until tender. 4. Spoon tomato mixture into mushrooms. 5. Sprinkle with basil and top with grated cheese. 6. Place mushrooms on foil lined baking dish or cookie sheet. 7. Cook at 400 degrees for 12 minutes. I made a few changes to the recipe. I halved it, left out some of the ingredients like the leeks, lemon juice, parsley and salt and I used dried basil instead of fresh. Go here if you want the original and complete recipe. They look delicious! Thank you so much for sharing it at SHOW-licious Craft Showcase! I think these looks fabulous and I have made something similar but must try your recipe with the portabellos!!! Please come link to my "Open House" blog party! I bet they were wonderful! They look so tasty :) Thank you for sharing at All My Bloggy Friends last week! 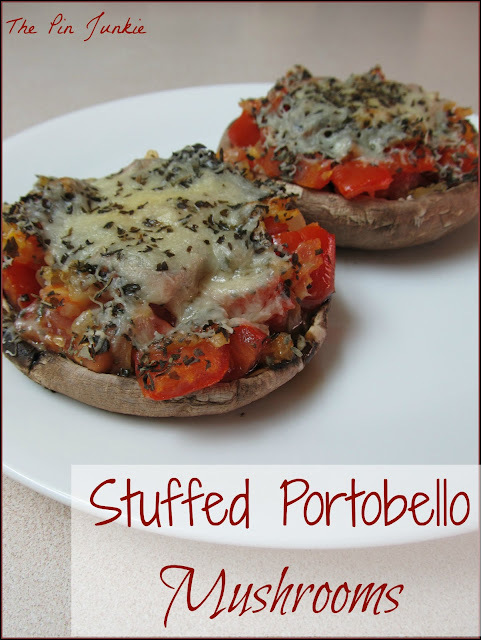 Oh I love stuffed Portobello mushrooms! I have never made them at home. You can bet I will be trying your recipe. I often sautee mushrooms to go over steak or chicken, YUM! Thanks for sharing with Share Your Cup. I will be featuring you. Wow - this looks really good! Glad you posted this recipe. I'm so glad you shared at Romance on a dime. Yummy! I love pizza and I love mushrooms, so putting them together is a genius concept for me. Portobello mushrooms are definitely the best choice for this recipe because they are big. Did you know that aside from being delicious, Portobello can also help reduce the risk of Alzheimer’s disease? Portobellos are a good source of niacin, which has been known to help prevent Alzheimer’s. Thanks for the info - good to know!